Part of managing employees is to set an example and develop good employees. 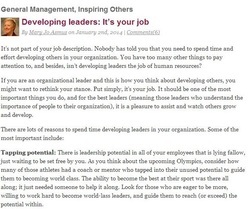 This post from SmartBlog on Leadership says that developing employees should be one of the most important things you do, and it should be a pleasure to assist and watch others develop. You can read the full post here.